For as long as the season has been in existence, Christmas has been associated with ‘what we’ve always done’; as with most Christian festivals, the holiday has done its fair share of borrowing liberally from the pagan festivals that preceded it – for example, the traditional spruce Christmas tree itself, which was first introduced to England by Queen Victoria’s Prince Albert, has its roots in ancient times, when it was perceived as being a potent symbol of perennial fertility. In Russia and Ukraine, Christmas is not marked on 25 December, but rather on 7 January – the Orthodox calendar uses the former ‘Julian’ calendar for religious festivals, and so in the traditional Russian Christmas, prayers are made and people fast, sometimes as long as 39 days, ending on Christmas Eve (6 January), when a 12-course supper is served, in honour of the 12 Apostles. Worth the wait, one can but hope. In the Czech Republic, many single women still frequently perform a curious ritual on Christmas Eve, to see if they will marry the following year. With their backs to the door of their house, they throw one shoe over their shoulder. If the shoe lands with the heel towards the door, she will definitely stay single, while if the toe points towards the house, she should start making wedding preparations. In Norway, tradition holds that witches and evil spirits roam on Christmas Eve, to steal brooms and ride the skies. Thus, all the cleaning tools are hidden, and men fire their guns to scare the witches, ghosts and goblins away. 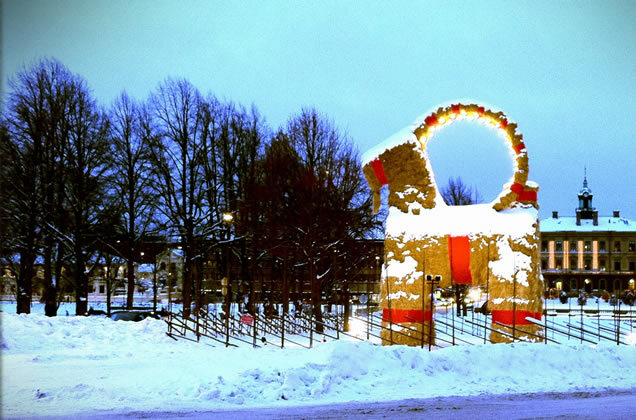 In the Swedish town of Gavle, a giant goat made of straw has been erected for the past 40 years, to mark the beginning of the festive season. However, since 1966, the goat has only survived ten times to Christmas Day, vandals, normally dressed as elves or even Santa Claus himself, setting the monument afire. In Slovakia, at the beginning of a traditional Christmas Eve dinner, the head of the family takes a spoonful of ‘Loksa’ (which is a traditional Christmas dish made from bread, poppy seeds and water) and throws it at the ceiling – apparently, the more mixture that remains stuck to the ceiling indicates the richer the ‘harvest’ (agricultural or financial) will be in the coming year. In Greenland, the height of Christmas delicacies is considered to be ‘Kiviak’, which is the raw flesh of an auk, wrapped in seal skin and placed under a rock for several months, until the ensemble is in an advanced stage of decomposition, and is a ‘treat’ that most Greenland residents find ‘delicious’. Apparently. In Caracas, the capital of Venezuela, the roads of the city are traditionally closed on Christmas Eve morning, so the faithful may roller-skate to Mass. In South Africa, many enjoy a Christmas dinner in the open-air – the traditional dinner is either turkey or roast beef with mince pies, or suckling pig and yellow rice with raisins, vegetables, and plum pudding, with crackers and paper hats de rigeur. In the afternoon, families go out into the country and usually there are games or bathing in the warm sunshine. In Scotland, the first person to set foot in a house in a New Year is thought to be very influential to the fortunes of the people who live there and strangers are, in general, thought to bring good luck – depending on the area, it may be better to have a dark-haired or fair-haired stranger set foot in the house. This tradition is known as ‘first footing’.